A small amount of tahina adds a velvety texture to this vibrant dip of roast red pepper, olive oil and lemon. Served with a pile of crusty fried halloumi, this makes a great snack with drinks. It's very filling, and just as well, because halloumi is an expensive cheese. It's also packed with calories, so I don't buy it often (in spite of the implorings of my teen sons, who adore halloumi with bacon and eggs, and can demolish kilos of the stuff if given half a chance). I was first introduced to halloumi-for-breakfast by my brother-in-law, who is of Cypriot descent, and it was he who showed me how to fry it in olive oil to rustling golden perfection. He showed me, all right, but it took me a long time to figure out how to get a good result every time. Halloumi's tricky to cook: it burns in an instant, or goes floppy, or melts all over the pan, or toughens to boot leather in a matter of minutes. So how do you get it right? First, the quality of the cheese is important. Some brands collapse in the pan; others are so saturated in brine that they never get really crisp, so it's worth experimenting with different brands. Woolworths have an excellent halloumi that is just right for pan-frying. Second, make sure you pat the cheese quite dry on kitchen paper before you fry it. Third, the oil should be very hot, but not smoking, and you need to watch the cheese like a hawk as it browns very quickly. Don't add too much oil - two tablespoons (30 ml) is enough - and don't overcrowd the pan. Last, drain the halloumi well on kitchen paper to soak up excess grease, and serve immediately. The quicker you get it onto the plate, the less chance it has to soften up. This vibrant red-pepper sauce is inspired by a recipe given to my by my aunt, Gilly Walters of Wedgewood Nougat. First make the dip. Heat the oven to 180 ºC. Cut a 2-cm slit in the side of each pepper and push the whole garlic cloves through the slits into the peppers. Place on a baking sheet and bake for 35-45 minutes, or until the peppers are soft and beginning to brown. Don't let their skins blacken. Remove from the oven, place on a plate, cover, and allow to cool. Tear open the peppers and retrieve the garlic cloves. Pull off the skins and cores and discard the seeds. Place the pepper flesh and garlic cloves in a blender and add the remaining dip ingredients. Process to a smooth paste (add a little more olive oil or lemon juice if the blades are reluctant to turn). Decant into a bowl, swirl with a little extra olive oil and sprinkle with a pinch of cumin. Cut the cheese into 7-mm thick slices. Pat very dry on kitchen paper. Rub a film of olive oil over the slices and coat generously, on both sides, with milled black pepper. Heat the oil - about 2 Tbsp - in a frying pan. When the oil is hot - a breadcrumb should fizzle vigorously in it - add the cheese and fry, in two or three batches, until golden-brown and crisp. This will take about a minute per side, depending on the heat of the pan. Drain on kitchen paper and serve immediately, with the dip and some lemon wedges. Yum yum yum! I just love red peppers, and I always want to buy tahini to use with hummus, but I never know what to do with the rest of the jar! This will go down a treat, come summer! Thanks! This really looks great! 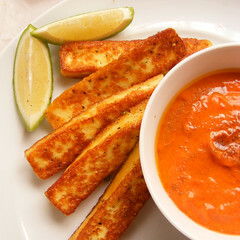 I haven't had halloumi before, but I'd love to give a try. What an awesome snack. 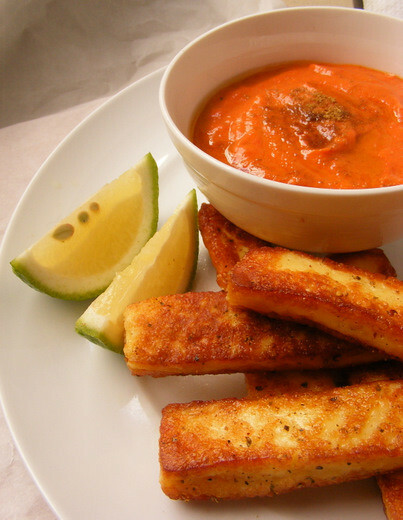 Halloumi is so good by itself but then you add a tasty dip and things are even better! Halloumis is one of my all-time favourite cheeses, and I LOVE that you can fry it. Definitely want to try coating it in black pepper as you did here. Yum!